Featured Artist! 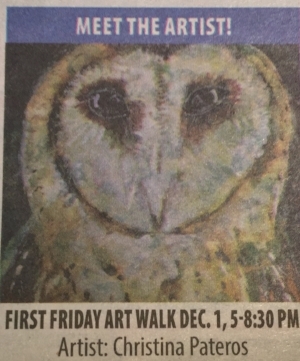 Niwot, Colorado, U.S.
What an honor to be a Featured Artist at the Niwot, Colorado Art Walk December 1. The theme of the show was 'Finding Home'. Decorating home with art that inspires, with beauty, depth, color, insights and wonder can change the way you feel. Thank you to all those who supported the arts and sought out my art in Niwot.